Thunderfist is one of Net Entertainment’s more popular games, thanks to its bonus-round potential, and decent base-game win sizes, and with an exciting expanding wild feature, each and every spin is as exciting as the next. Combining the world of Martial Arts, with cartoon-like characters, Net Entertainment have managed to make Thunderfist great, both aesthetically, and in the way it plays. 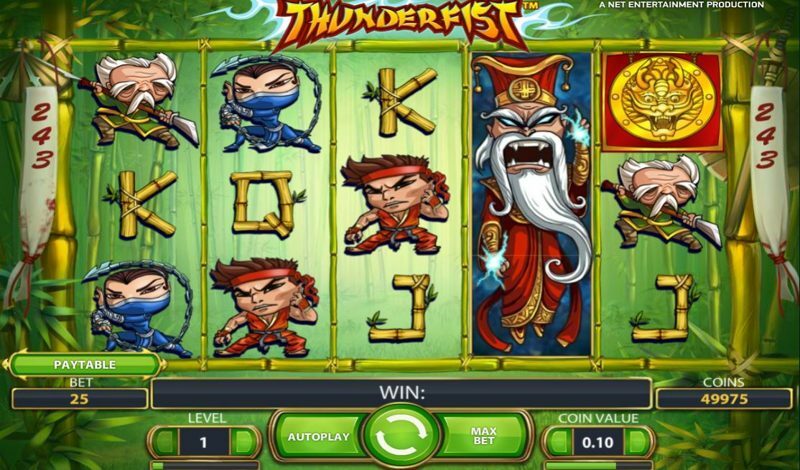 What’s more, Thunderfist uses the 243-ways-to-win structure, prominent in some of Net Entertainment’s latest slots, and more notably, made famous by Microgaming, in their Immortal Romance and Game of Thrones titles. Thunderfist features a selection of symbols on the reels, with the low-paying symbols depicted by playing cards, and the high-paying ones with a variety of game specific symbols; these include Red, Green, and Yellow Martial Arts athletes, as well as Pink and Blue female characters. While the symbols are a little underwhelming, design wise, the actual design of the slot is far more “Net Entertainment”, and the development team have clearly spent a lot of time, effort, and money in creating a unique-looking background, and game design. The wild symbol in Thunderfist is a “guru-looking” Martial Arts instructor, who plays a big part during the bonus-round, and the scatter symbols are depicted as gold coins. 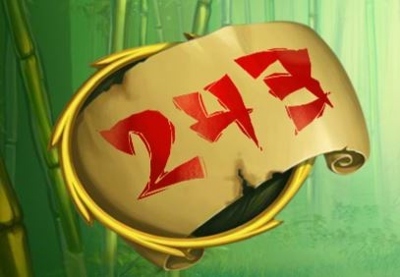 The wild can land on any reel, and can land between 1 and 5 symbols. The scatter symbols can also land on any reel, and there are five in total, making it possible to land one on each reel. Thunderfist is great played on a desktop device, but it’s also available to enjoy on mobile phones and tablet devices, and with Net Entertainment ensuring the game doesn’t require any special software installed or downloaded, the majority of mobile players can begin enjoying it straight away. This unique pay line structure essentially removes the need to worry about pay lines. You see, unlike conventional slot games, you needn’t worry about having to land relevant symbols on the matching paylines – instead, one symbol in any position on consecutive reels (from left-to-right only) will award a win, and the more symbols per reel, the more combinations are paid out. This unique structure offers the potential to win huge sums of money, if the right symbols land, and 4-of-a-kind and 5-of-a-kind wins are seldom singular – so it’s no surprise that many players choose only to play 243-ways-to-win games, these days. 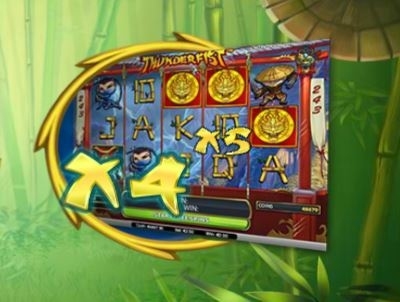 Land three, four, or five of the scatter symbols anywhere in view on the reels, and you’ll be awarded with ten, fifteen, or twenty free-spins, respectively. During the free-spins, you’ll notice an increase in how many wild symbols are present on the reels, and every win – no matter how big or small – will be subject to a random multiplier, either 2X, 3X, 4X, or 5X. After the win, all the multipliers will appear on the centre of your screen, and they’ll be removed one by one, leaving your multiplier remaining on the screen.